Mar Gauge is a meditation on objects which may or may not hold value in our implicitly impenetrable social constructs. As this history progresses from the physical mediums to one of algorithms and faith in institutional constructs, the importance of these physical simple functional materials remains currently in pure sight yet dismissed by the agents of attention. The install will focus on a devaluation of these precepts, with the attitude that they may perhaps be invasive on one’s personal scope of interest. Mar Gauge is the artist’s personalization as a despondent blind eye to the machine functions of history, and both a celebration and mediation of the units that may withhold, reinforce, and hold together its prepackaged beauty. These objects will deteriorate much like the minds that agree to the existence of power structures and means of life. Objects will be presented out of context, in the contexts and reinforced with other objects, alone, on video, on fabric, and under logistic analysis. Christopher Reid Martin is a multidisciplinary artist, currently residing in Los Angeles. He first began working with sound in Orange County in 2004, layering sounds from various field recordings of daily life which convey living truths and over processed instrumentation as the reactionary expression. These expressions came to birth the solo project known as of Shelter Death. Shelter Death is the audio/performance project amongst many by Christopher Reid Martin, sound, video, and performance artist now residing in Los Angeles. Initially started strictly as experimentation with sound in Orange County, unorthodox recording methods and unconventional sound sources such as broken amps and manipulated radio signals were used to produce a handful of cd-r’s and tapes released on Via Injection, Irrational Tenttent, and A.C.T.I.O.N. Rarely performed live, Shelter Death has played a handful of west coast show from 2012-2015 incorporating ladders, overhead projectors, and sound into a subversively narrative expressive performance. Los Angeles experimental label Crystalline Morphologies will be releasing S. Death’s I Cannot Hear the Filthy City in August of 2018 marking three years since the last release. In 2010, Christopher had taken his creative endeavors into other avenues, releasing tracks under various formats under his shared Orange County based label Via Injection. Christopher’s creative repertoire expanded when he began documenting his experience in countries outside the U.S., by taking field recordings, foreign radio recordings, and/or taking photographs. Photographs were either left unadulterated as they were taken or digitally manipulating and layered these with old scanned various schematics. This has led to an ongoing body of work, which fuses reality in the form of photography, with corroded ideas in the form of chopped manipulated grids and manuals. Christopher has and continues to show work in several art shows and has performed live in numerous events in projects such as Bailouts, Via Injection, Shelter Death, Rotary ECT and under his own name. he has performed with artists Joseph Hammer, James Roemer, Andrew Scott, Gabie Strong, Michael Morley, and Daniel Hipolito. 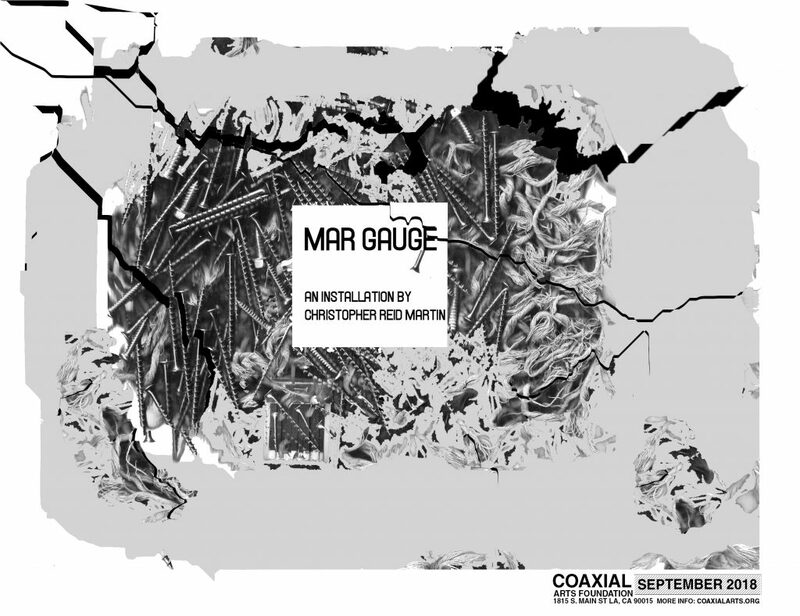 Mar Gauge will be Christopher’s first solo show.